The creative work I produce is developed through fabricating (metal, wood, appropriated) objects and casting (bronze, aluminum, glass, chocolate, wax, resin) while transforming my ideas and experiences into physical realities. I have an interest in the orchestration of a variety of materials and search for contrast between the organic and geometric, the abstract and representational, and the raw and refined. Themes, sources, and objects employed in my work range from scientific and historical facts to global contemporary issues. I recurrently forge in layers of meaning that can interconnect to my own personal history, which gives me an ancestral connection. Many of the forms I create are objects of implied utility, security and protection, which are used as metaphors for our psychological behavior, and for the phenomenology of the body. Architectural furnishing structures like a bed, chair and table, allow me to explore specific polar states that are relevant to the structure and also to the personal psyche such as; large/small, inside/outside, private/public, adult/child, beginning/end, birth/death. The sculptures and installations fashioned are a means to reflect poignant elements of our society. Part of the narrative in my pieces has to do with the human condition. In particular today’s elderly and youth, as well as our social and environmental conditions. Years of Living Dangerously (yearsoflivingdangerously.com) and other historically significant situations we are faced with as a global society have inspired my current and recent research and interests. I have a desire to exhibit work in a larger public setting. Presently, I am involved with working on a large-scale sculpture commission based on literacy. In this work, I am creating a life size bronze figure of American author E. L. Doctorow for the city of New Rochelle, NY. Accompanying the figure will be his novels cast in bronze along with a large panel serving as a backdrop that include his selected famous quotes. Photographic and drawn images are continuously being generated and are integral to my research and creative process. 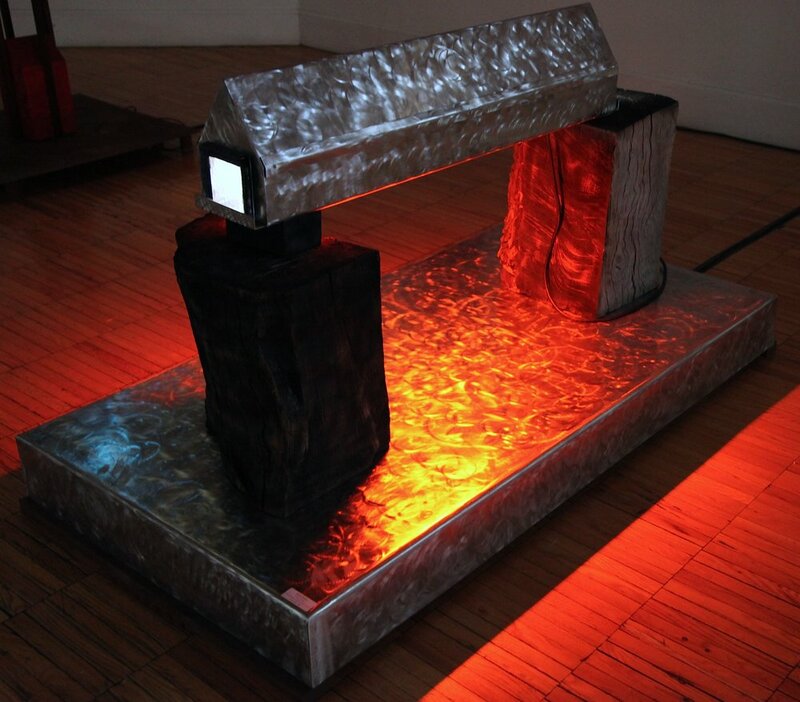 These two-dimensional forms of communication are often thresholds to my sculptural work and installations. To the viewer I hope to engage and reflect my inquiries and interests related to the human spirit and sensitivity toward all life forms. It’s my desire for my sculptural work to be thought provoking as I attempt to create a richness of meaning with the ambiguities, enigmas, multiple layers and conflation's of both form and content. Ultimately, I am responding to some my interests (and those of others) research, emotions and environment while questioning, and examining, the world in which we live. As an artist and educator my aim is to broaden the visual, intellectual and aesthetic capacities of students in their pursuit of careers as dedicated and serious professional artists. I teach the idea that art making is a unique form of inquiry into the relationships between form and meaning that derive from visual awareness. In this view, the making of art is not merely the production of aesthetic objects, but is a process for probing the conventions of art through which awareness; cultural values and personal philosophies are defined. I view the beginning of student's involvement with art making as a demanding, ongoing, and unlimited method of self-discovery bounded only by the depth of each student's personal commitment. Emphasis ideally is not simply on the production of competent art, but on the discovery of ideas and the investigation of the artistic possibilities raised by increased visual sophistication. My goal is the development within each student of an attitude toward art making as an outgrowth of personal philosophy in which excellence is not an endpoint, but is a continual standard measured by the level of one's search. Building courage and fearlessness in individuals is important as they become seriously involved in creative acts. I believe one of the most important things in teaching, is the unique and collaborative relationship that is built between the student and teacher. Freedom to communicate creatively should be first before judgment and self-criticism. Art should be taught by active, working artists. The best way to learn is to follow the act with complete conviction-to teach art as though everyone in class is going to be an artist, even though we do not expect everyone to be an artist. I believe the entire order of teaching should be toward developing the student to the highest degree of creative, individual thinking. Practically, art teaching can hardly be objected to, but spiritually it involves an effort to teach perception and an opening toward perceptual vision, which exists nowhere else in the educational system. I think that direction with example is effective. Thus, I give many demonstrations to my students on a variety of techniques and skills to expand their technical knowledge, competence and confidence. With my extensive experience maintaining sculpture studios including wood shops, metal shops and foundry facilities, I have the ability and knowledge to teach my students the use of many types of hand tools and power equipment. Finally, I teach my students to write and draw; and to draw to be so proficient that the drawing becomes a language to supplement ideas and art. The written component of communication further supports thoughts and ideas. Being a deeply committed artist and educator I feel it is necessary to provide and maintain an open, supportive environment in which young artists can creatively evolve, develop, and mold ideas into form. I have ability to assist students form respectful attitudes and interactions with people who differ in abilities, attitudes, and cultural experience, with sensitivity to factors that affect our own assessment of others. I celebrate diversity that includes, but is not limited to ability/disability, age, culture, ethnicity, gender, language, race, religion, sexual orientation, and socio-economic status. Thus, I foster an environment that promotes diversity, inclusivity, collegiality, and transparency. As vertebrae of the backbone of learning, I foster individual innovation and personal growth. I have recently implemented particular digital humanities into my seminar, art history and studio courses. To my students I encourage commitment, self-discipline and hard work. Ideally students are inspired to acquire an appreciation of art and life in general, to become knowledgeable about aesthetics, art history, cultural and critical studies in order to develop a meaningful art practice in society. For the young artist, a college education both prepares them to apply creative problem-solving skills to all areas of their life and provides the confidence to continue exploring artistic endeavors. Participating as a teacher, in this adventure called art, is an extremely rewarding experience.